The Philadelphia Flyers announced that they have signed 6’0”, 215-pound defenseman Marc-Andre Bourdon to an entry-level National Hockey League contract, according to club General Manager Paul Holmgren. Per club policy, financial terms were not disclosed. “Marc-Andre turns pro after an outstanding 2008-09 season in the Quebec Major Junior Hockey League, where he was honored for his play during the regular season and in the playoffs,” said Holmgren. “We believe Marc-Andre has tremendous potential to develop into a solid defenseman at the next level." Bourdon, 19, split time between the Rouyn-Noranda Huskies and Rimouski Oceanic of the QMJHL in 2008-09, where he combined for 18 goals and 42 assists for 60 points and 112 penalty minutes in 54 games. He began the regular season with Rouyn-Noranda, where he recorded 38 points (11G,27A) in 37 games and was later traded to Rimouski on Jan. 5, where he posted 22 points (7G,15A) in 17 games. He recorded 13 points (1G,12A) and 25 penalty minutes in 13 QMJHL playoff games to help Oceanic reach the QMJHL Semifinals. Overall, Bourdon ranked second among QMJHL defensemen in power-play goals (12), third in goals (18), fourth in both points (60) and penalty minutes (112), while being tied for fourth in assists (42) in the regular season. In the playoffs, he finished tied for the team lead in assists (12) and was third on the team in points (13). Bourdon was also named to the League’s First All-Star Team for the second straight season. Over parts of three seasons in the QMJHL, Bourdon has recorded 147 points (32G,115A) and 306 penalty minutes in 186 regular season games, while adding another 35 points (3G,32A) and 71 penalty minutes in 46 postseason games. Following the 2007-08 season, Bourdon was awarded the Emile "Butch" Bouchard Trophy as the QMJHL’s best defenseman, recording 59 points (12G,47A) and a plus/minus rating of +39 in 69 games. 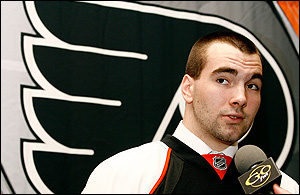 A native of St-Hyacinthe, Quebec, Bourdon was selected by the Flyers in the third round (67th overall) of the 2008 NHL Entry Draft.